3 Bedroom House For Sale in Bakewell for Guide Price £450,000. Featured In The Big Open House Event 27Th And 28Th April - Call The Branch To Arrange A Viewing! Stunning Barn Conversion Finished To A High Standard Specification Throughout!!!! 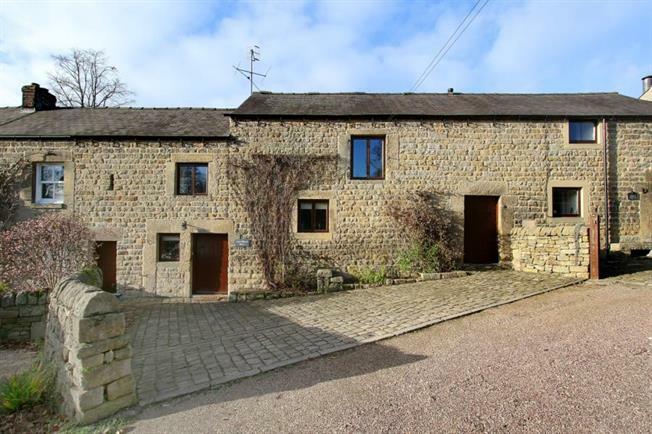 Set in the picturesque village of Baslow, this stonebuilt three bedroom family home is believed to date back to the 1700s yet benefits from the features of a modern property. The village is set in the heart of the Peak District on the doorstep of Chatsworth House Estate and benefits from good local schools, convenience store, local boutique, tea rooms and friendly bistros but is perfectly located with easy access to Sheffield, Chesterfield and Manchester. The property has been beautifully renovated throughout, with bespoke fittings and incorporating some of the original features such as beams and stone work. Stepping inside, you will find a reception hallway/lobby with a tiled floor, a utility area to one side with Belfast sink and storage, a wet room and toilet. Steps lead up to the spacious open plan kitchen/dining room with a beautiful bespoke kitchen featuring wall and base units, free standing cooker and integrated dishwasher. This room leads through to a good sized lounge area. The room features an exposed stone wall, wooden beams, feature floor and an eye-catching fireplace with living flame gas stove. A staircase leads from the dining kitchen to the first floor, which has a guest bedroom with built in storage and a third bedroom with built-in bunk-beds: both with exposed beams. Further stairs lead to the spacious upper level which comprises of: large master bedroom with wooden flooring and beams; family bathroom with white suite and beautiful fixtures and fittings; study with velux window, built in glass desk and shelving. The property benefits from a new high efficiency boiler and feature column radiators throughout. Externally, to the front of the property is off road parking space for a number of vehicles. To the side of the property is a secure access walkway with boiler room and excellent storage area for boots and outdoor equipment. The rear garden has a large storage shed for bikes and garden tools and an archway leads to a cobbled patio with raised flowerbeds. Viewing essential: this quality of property doesn't come onto the market very often.